When it comes to training, virtually anyone and everyone includes push-ups in their programming. Whether your goal is to build muscle, lose body fat, or become a better athlete, well-performed push-ups can help you get there. I’m a huge fan of the push-up for obvious reasons – and if it’s not obvious, grab a cup of coffee and read this first! Today I want to focus on one of the most common errors I see in the push-up: Not finishing the rep.
There’s a natural tendency to “sag” or “hang” on the shoulders at the start/finish of the rep. Instead of allowing this sag, work to actively reach long at the start/finish of every rep.
Last but not least, the reach is subtle. If you exaggerate it you end up rounding through the mid-back, which is not what we want. Think about subtly reaching long through the mid-back and shoulder blades. 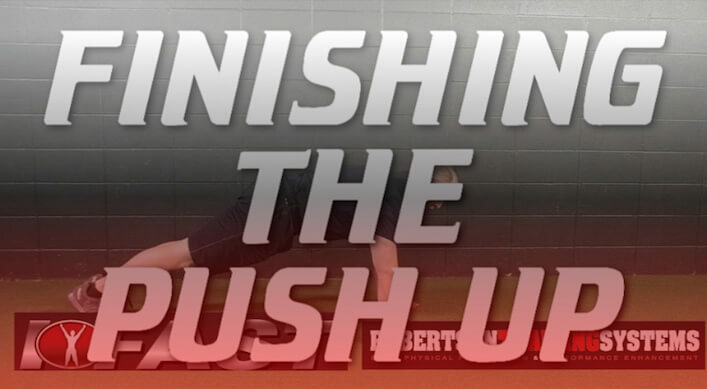 I know some of these videos may sound simple, but when you make this little tweak to your push-ups, I guarantee you’ll get more out of them as a result!